Very Very Vicky: Making the Living Room Liveable! Are you ready? It's time to put things in good order with the living room at The Coral Cottage. 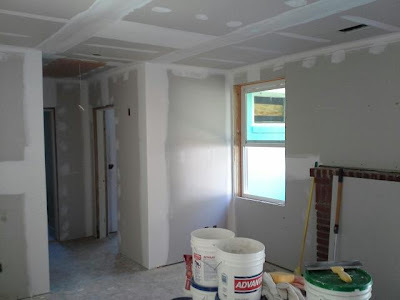 You can view the BEFORE photos here. The room was rewired and then drywall was hung over the concrete walls. 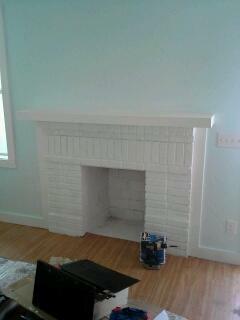 We decided to paint the fireplace and Horton Remodeling added a mantel. 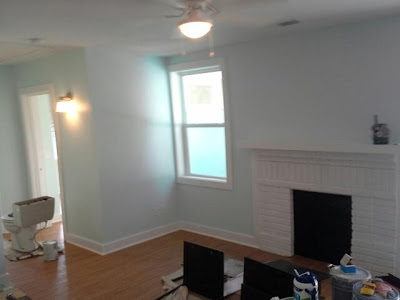 We painted the inside of the fireplace black. I will put candles or something inside because the chimney doesn't work. Don't ya love seeing the toilet in the hall? We were working in the bathroom too! Once we had the room ready it was time to furnish it! See you with those pictures next time! Can't wait to see. Already such an improvement over the before pictures! I remember when you first showed me those, I just thought how awful and dark the place looked. You and Jane have worked wonders. All your hard work is paying off in spades! Thanks--it's exciting to see it come together!